Our Queen Charlotte Street and Wells Road clinics have in-house studios with a range of Pilates and yoga classes. Our instructors are hand-picked and our studios are small enough to ensure you receive superb tuition. Both yoga and Pilates promote health and well-being through physical exercise. Pilates aims to improve health by strengthening the body in a balanced way. Some Pilates exercises are done on a mat, while others use specialist equipment to provide an element of resistance. Pilates can benefit anyone of any age looking to build strength, improve posture, increase mobility and relieve tension. For a list of class timetable with prices, click here. 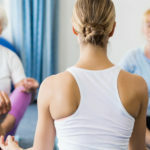 Yoga improves both your physical and mental health. The regular practice of postures (asana) and breathing exercises (pranayama) develops strength, balance and flexibility. It can boost your immune system and help you deal with everyday stress. Yoga can be adapted for you, whatever your age or experience, to work at your own pace. 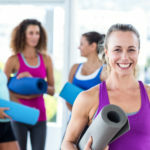 We have a range of yoga classes at our Queen Charlotte Street and Wells Road clinics. For more information, including a class timetable, click here. Bristol-based company Soul Pilates operates out of our Queen Charlotte Street clinic. From our fully equipped Pilates rehab studio, they offer group classes and one to one sessions with experienced Pilates instructors to give you greater body awareness, improved posture..
We also have a number of Pilates classes at our Wells Road clinic, including group classes and one to one classes. ..
Our Queen Charlotte Street clinic has a purpose-built yoga studio. The studio is light and spacious with great views over Queen’s Square..